This document covers the installation and use of this theme, reveals some answers to common problems and issues. We encourage you to read throughout this document if you are experiencing any difficulties. If you have any questions that are beyond the scope of document, please feel free to contact us via our Support Tickets System. Quickstart Installation: Suitable if you have your first installation and want to get a whole new fresh site as our Demo. 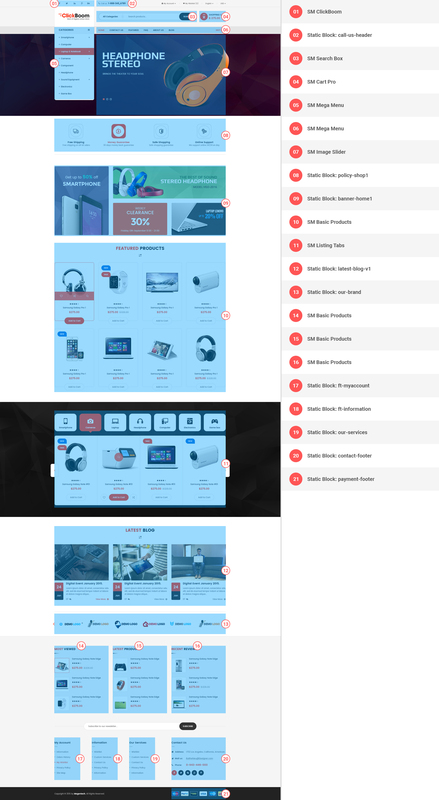 Manual Installation (including Theme Installation): Suitable if your store is full with content that you don’t want to overwrite. 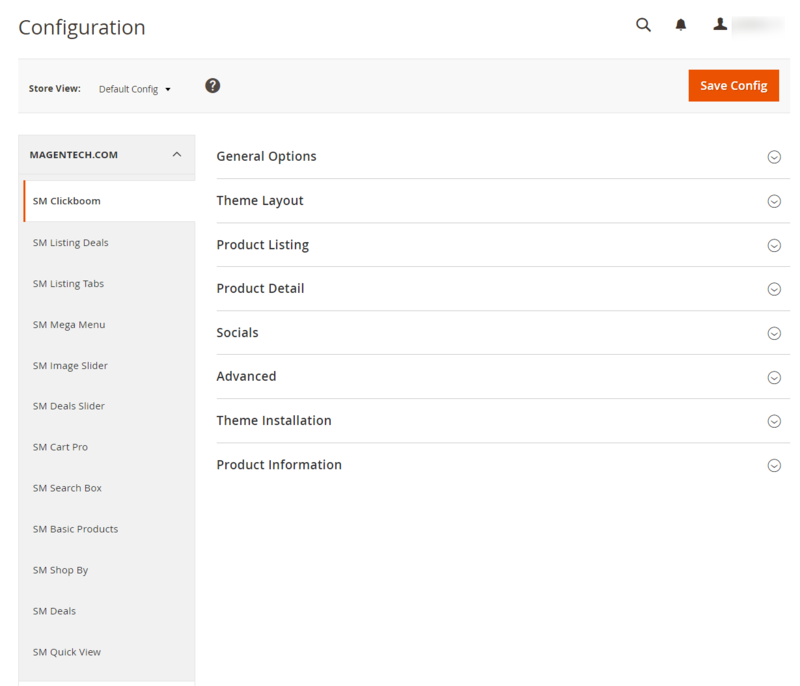 Magentech provides SM Quickstart package for each theme which aims to ease the installation for users. Please note that with Quickstart, all your existing data will be overwritten. Thus, if you plan to start your site from the beginning, it will help you save much time of installing and configuring. 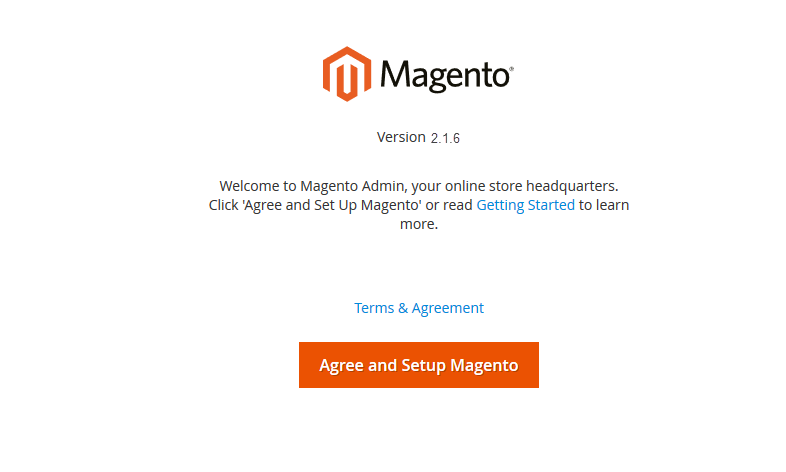 Note: Follow Magento 2.0 Installation Guide to install the Composer before doing this Quickstart installation. 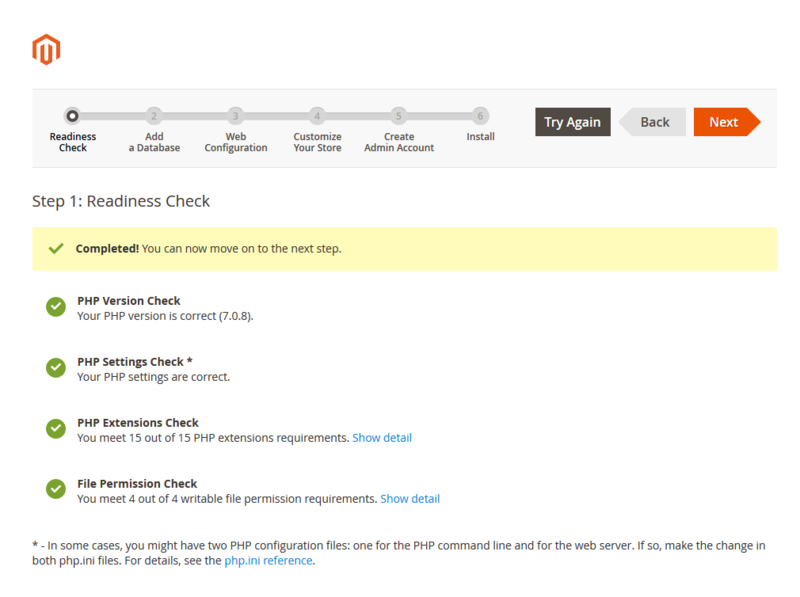 After successful import DO NOT run magento. Go Here to readmore about the action. 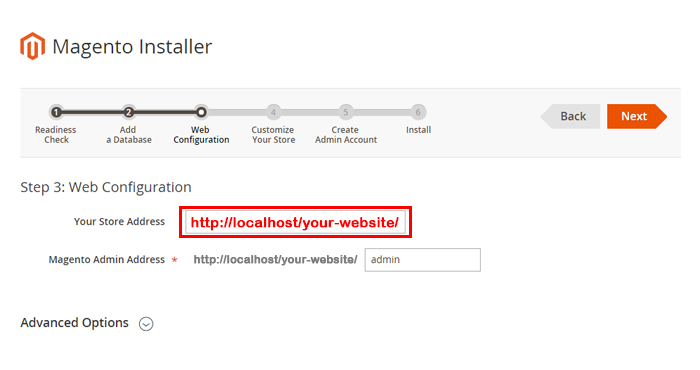 Step 5: Run installation process by opening browser and navigate to your URL (where the Quickstart uploaded) to load default Magento installer and follow each step of the Installer so that the installation process can be set. 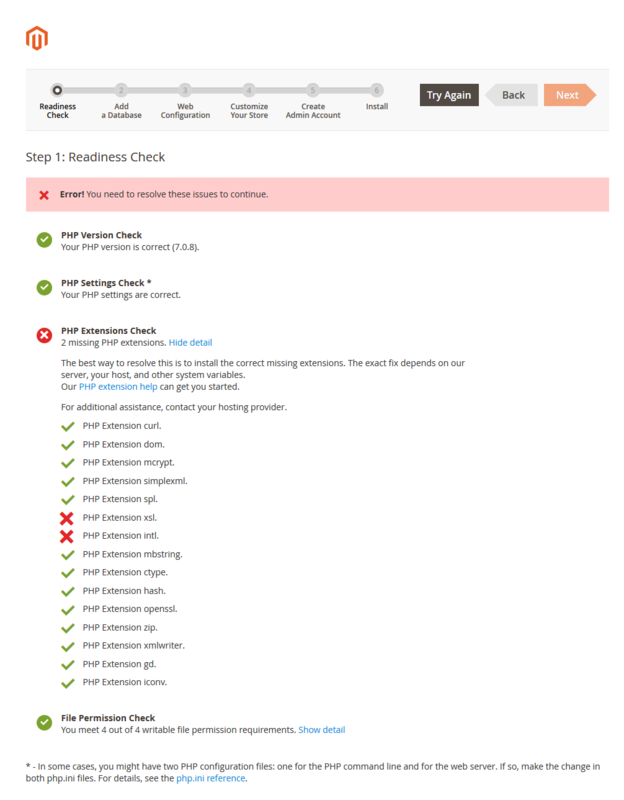 Step 6: Choose Start Readiness Check. After Start Readiness Check is completed, select Next . After modification, need to save the file(php.ini) as well as need to restart the Apache Server and check out the result. Step 7: Enter server and database in step 2 and then click on Next. 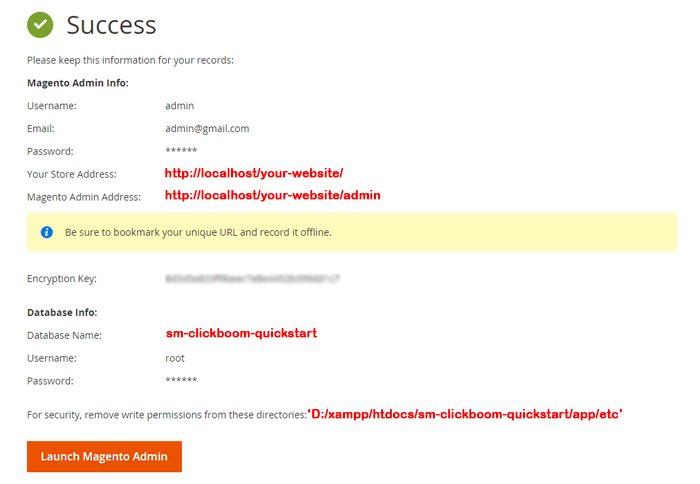 Step 8: Put your website link and continue to click on Next. 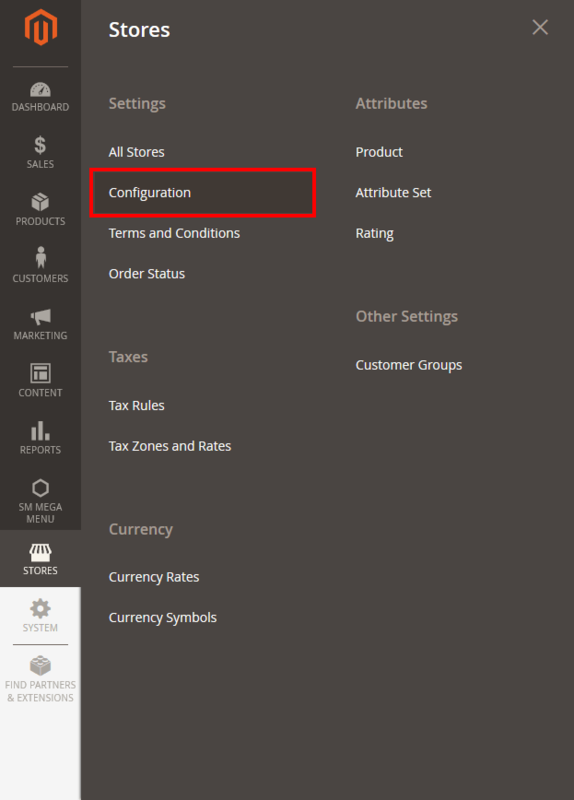 Step 9: Customize your store: you can choose Time Zone, Currency and Languages. 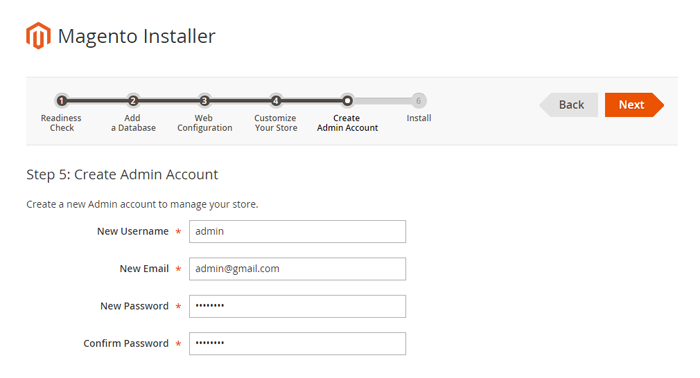 Step 10: You need to Create Admin Account. Enter your information and move to the next step. Step 11: In this step, you should click on the button: Install Now. After clicking on the button, the Admin Login screen will be opened and you can use admin credentials to login on this screen. It will open Admin panel after successful authentication. 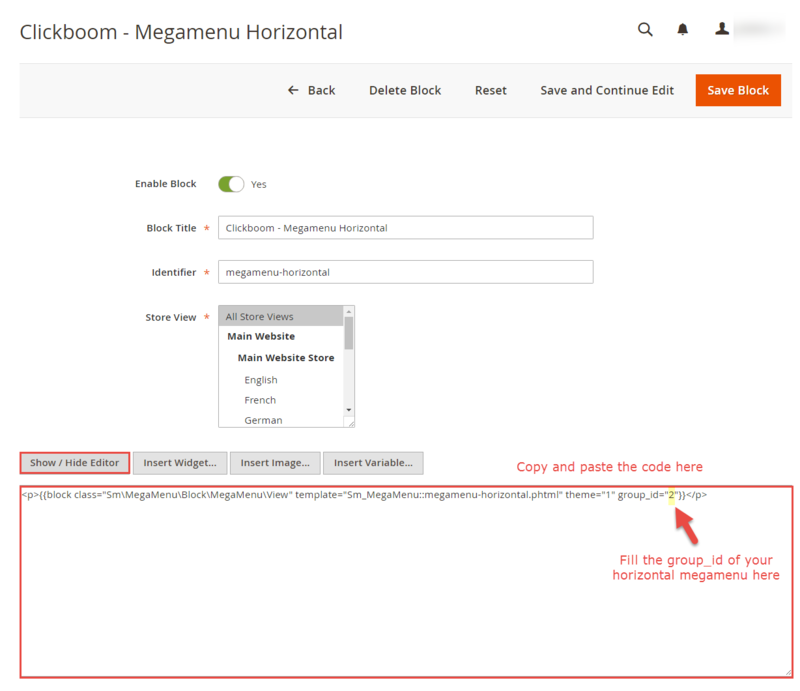 Step 1: Please unzip ‘sm_clickboom_theme_m2.1.x-2.2.x_v1.9.0′ file and upload folders app; pub from the theme package to the root of your Magento site folder on your server. Note: You could change the name of this folder. However, if you want your website run correctly, it need to have the same name as the database. Now we are going to verify Composer installation, Deploy static content, Clear compiled code and the cache, Reindex the Magento 2 blocks. 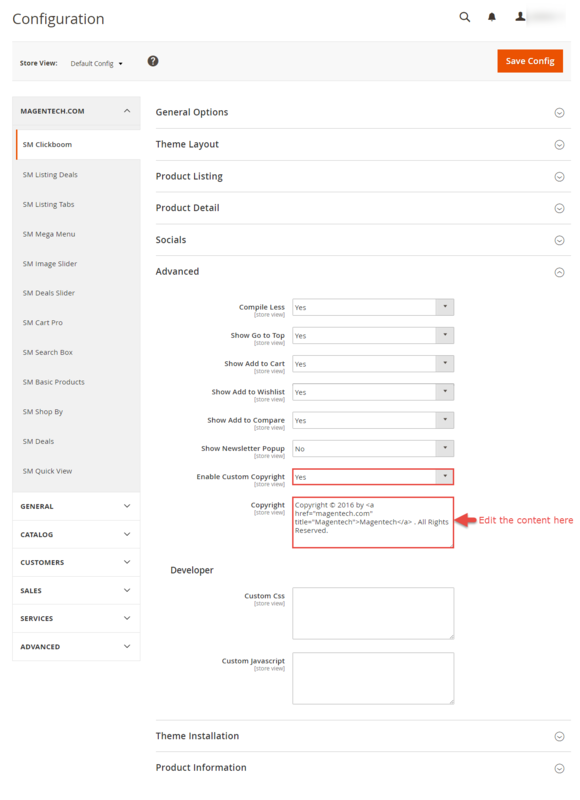 Remember that you have had the Composer before doing this step by following Magento 2.0 Installation Guide to get the Composer. On Windows server environment, to perform all above actions, press WINDOWS KEY + R to open RUN dialog and type cmd to open Command Prompt. Type cd PATH_TO_YOUR_MAGENTO2_FILES to enter in Magento 2 ROOT directory. 1. Now to verify Composer installation in above directory, type composer install. If you get any error in this step, please check your Composer installation. 2. 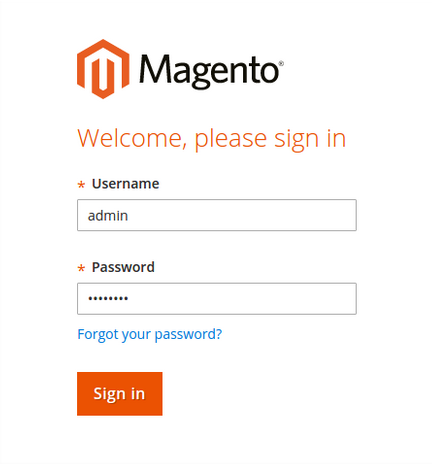 In this step, we are setting up static content to deploy on our Magento store. To perform this, type php bin/magento setup:static-content:deploy. 3. Clear compiled code and the cache by typing php bin/magento setup:upgrade in CMD. Typically, you use magento this command line to update components and each component can require different compiled classes. 4. And finally, to Reindex Magento Static Blocks type php bin/magento indexer:reindex. 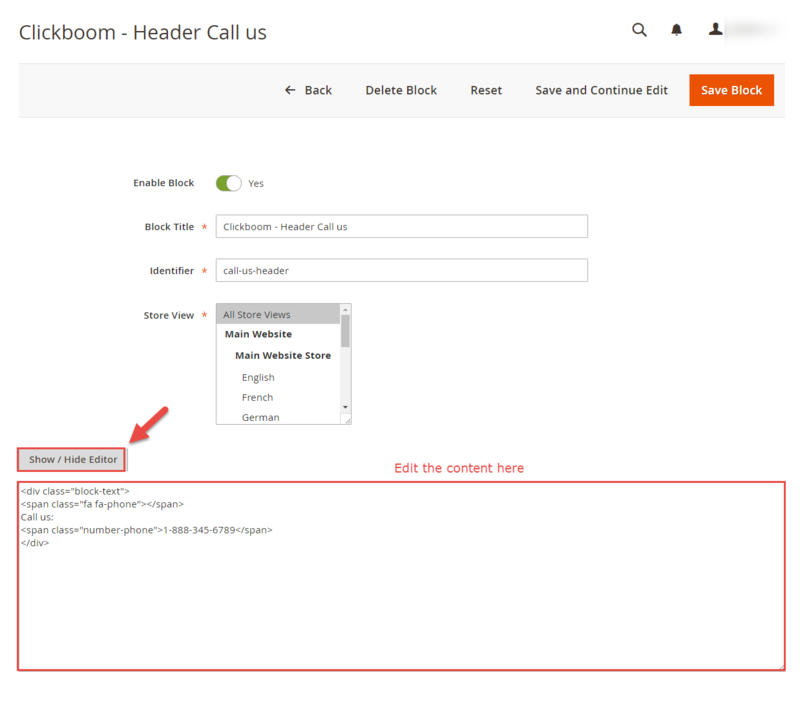 The magento “catalog images:resize” command enables you to resize images for display on your storefront. The message “Product images resized successfully” displays to confirm the command succeeded. Note: If you are using the Admin Panel when copying folders in step 1, you need to log out and log in back. Step 4: Disable Cache: Go to System >> Tools >> Cache Management, click ‘Sellect All’ button, then choose ‘Disable’ and click ‘Submit’ button to complete the action. 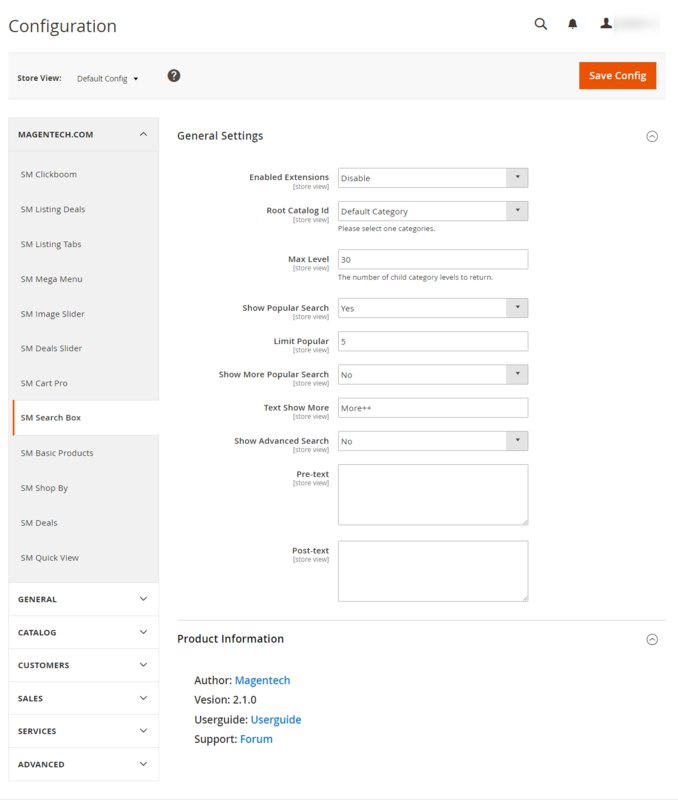 Step 5: Select “SM Clickboom” theme in Content>> Design>> Configuration page for Magento 2.1 version. 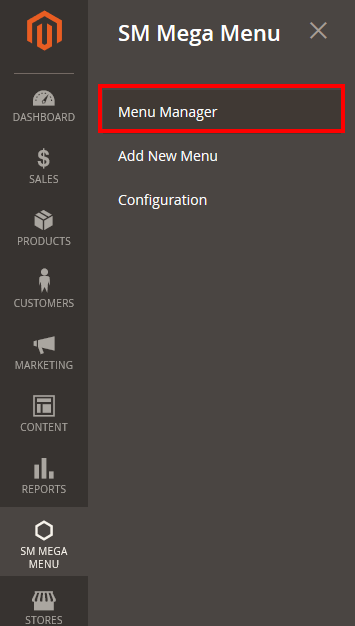 Step 6: Click “Save Config” button to save your changes. 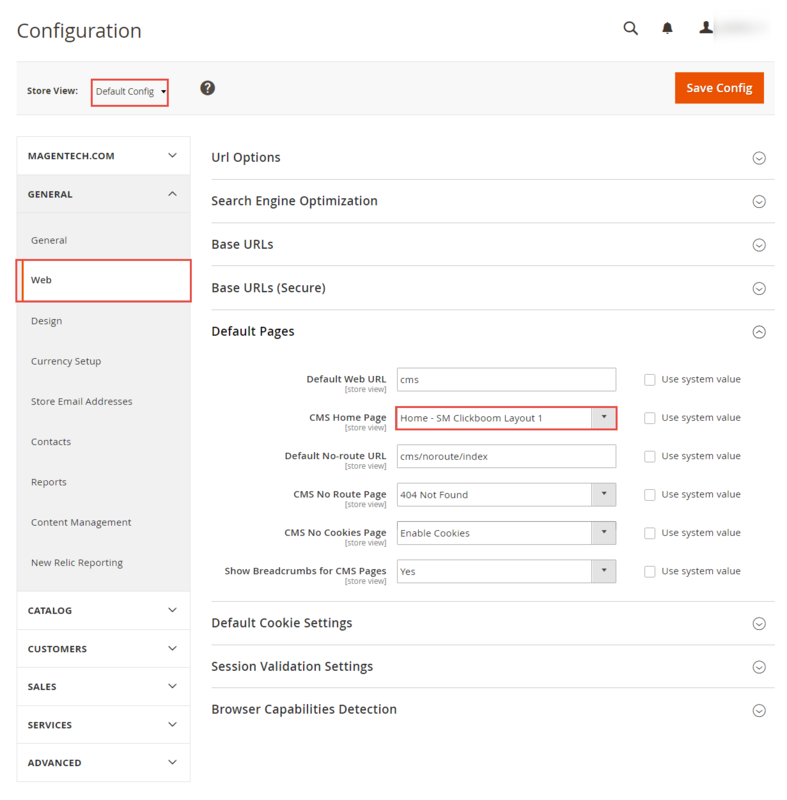 In Magento admin panel, navigate to Stores>> Settings>> Configuration >> MAGENTECH.COM >> SM Clickboom and configure its settings as you want. Please click Here to view the theme settings. 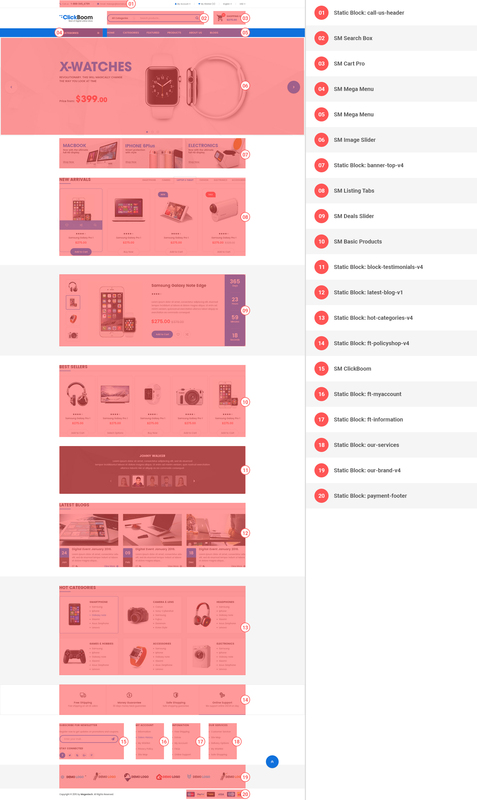 Configure General Options with Color (of theme), Body Font, Elements Google Font, Menu for any store. 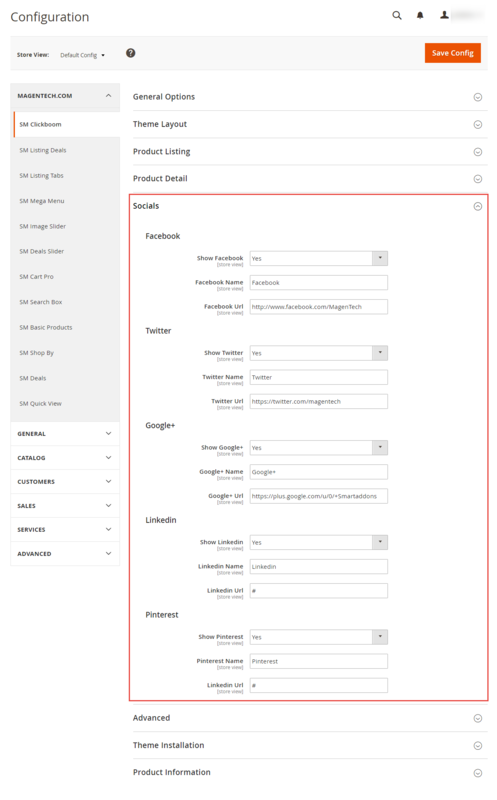 Configure the Product Detail To zoom image of product, adjust Zoom Mode, Custom tab, and content, etc. We have created One Click Installation for users to quickly set up your theme the same way our demo is set up. 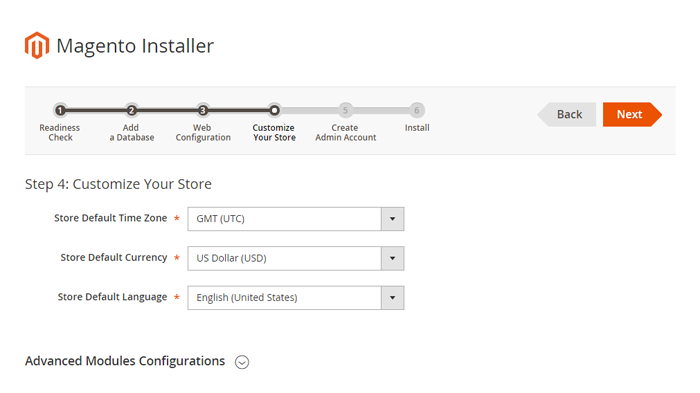 In order to do demo installation, you should import Static Blocks, CMS Pages and Demo in Stores>> Settings>> Configuration >> MAGENTECH.COM >> SM Clickboom >> Theme Installation. 1. 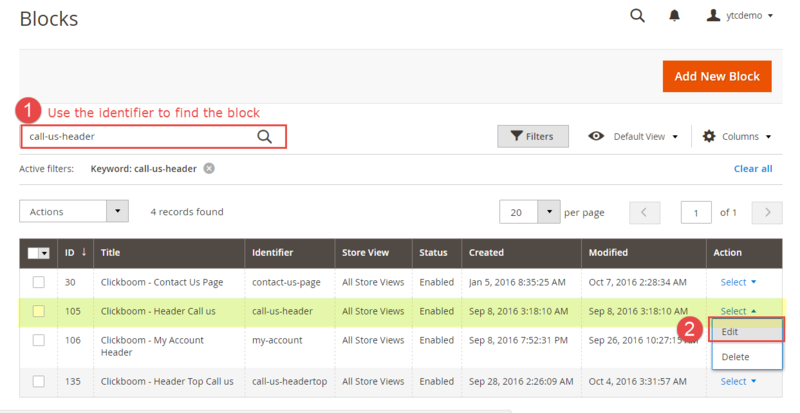 Press the buttons named ‘Static CMS Blocks’ and ‘Pages’ to import all default blocks and pages. 2. Click “Demo X” button to install demo version that you prefer to install. 3. 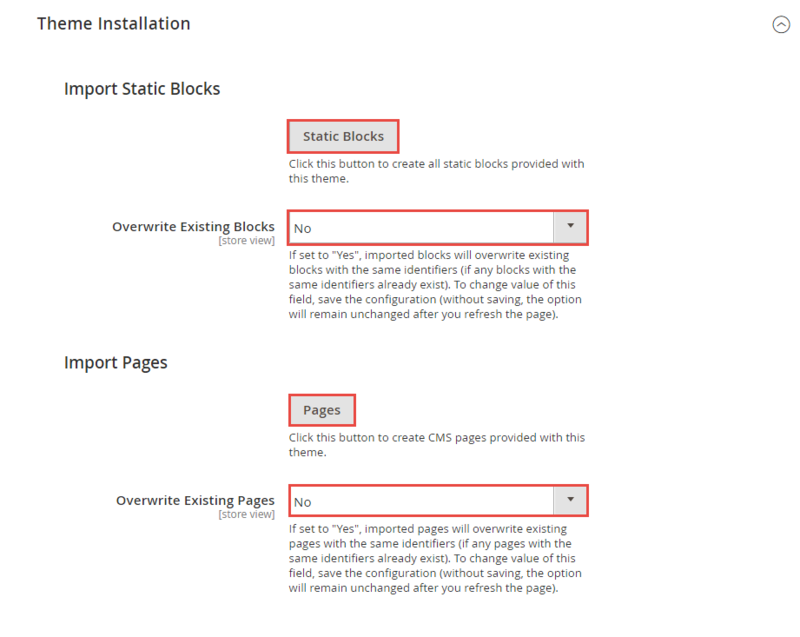 Please remember that: If you have imported these Static Blocks, Pages successfully, you would have all blocks and pages provided with this theme and you do not need to create any static blocks or pages manually as the following instruction of this document. 4. 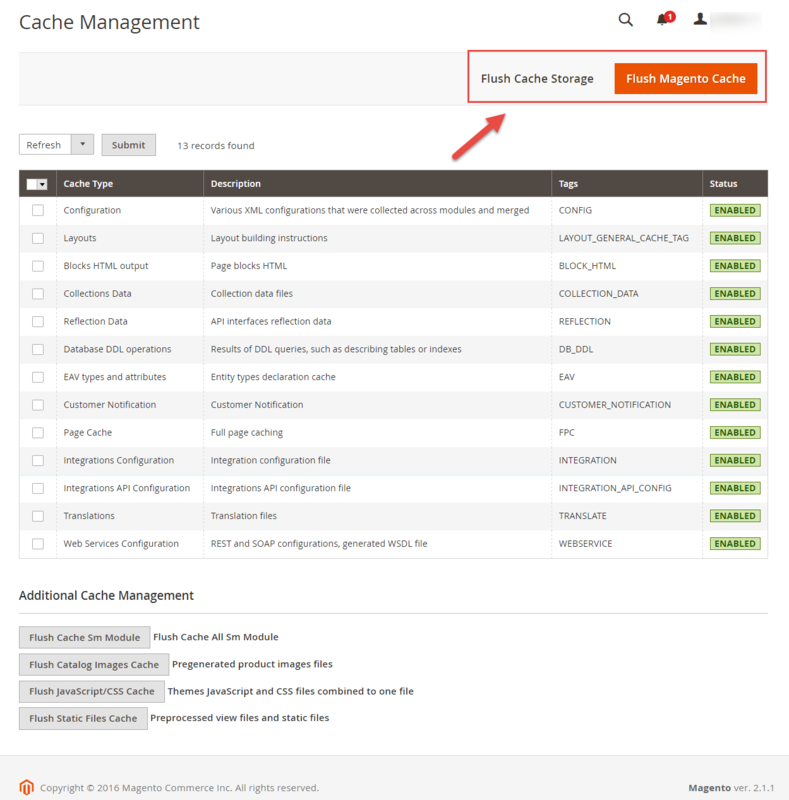 Flush Cache: After successfully import your demo, save Theme Settings and Design Settings and clear the cache by using this command as php bin/magento cache:flush in Command Prompt. 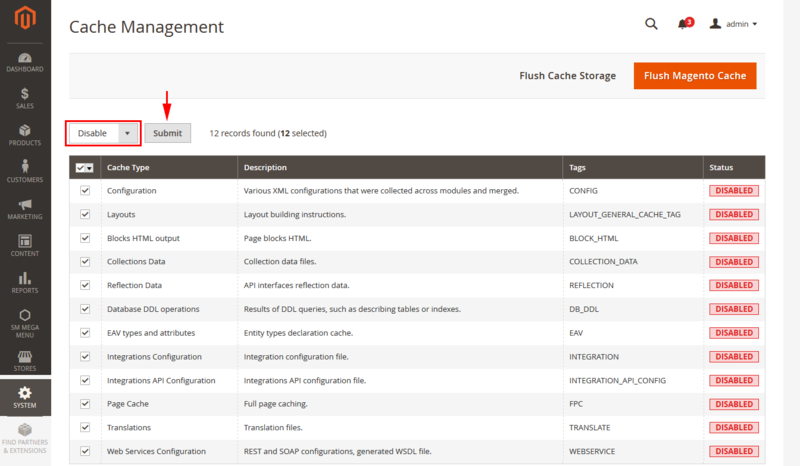 Or you could go to System >> Tools >> Cache Management, click ‘Flush Magento Cache’ button to flush all the cache. The four layouts of SM Clickboom can be illustrated as follows. In these images, you could see how our extensions and static blocks are placed in our layouts after importing Static Blocks, Pages and Demo. 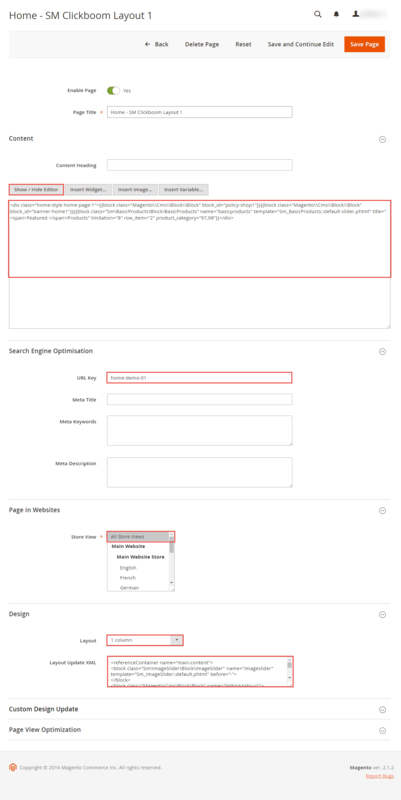 To configure the default home page for your store, please go to Stores>> Settings >>Configuration>>General>>Web>>Default Pages tab, select the desired page in the CMS Home Page field and save configuration. 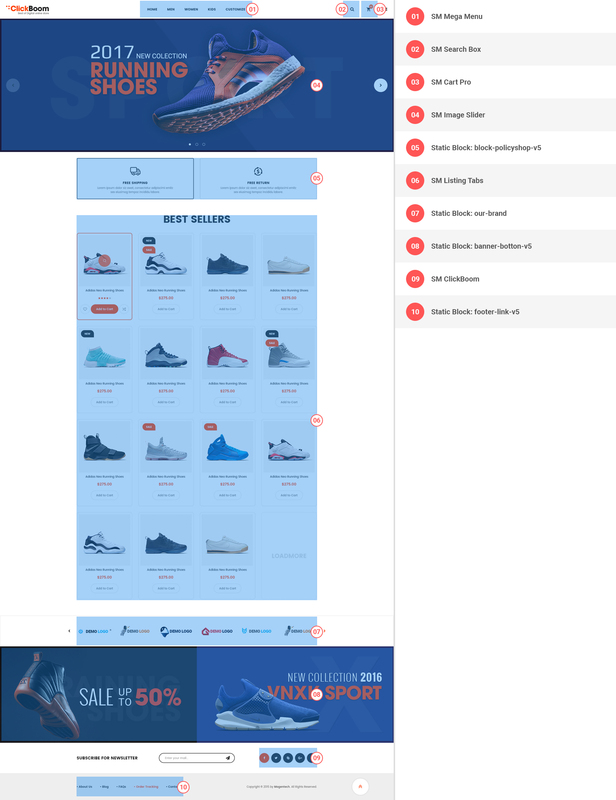 You need to change to the website / store view that you want to change (the dropdown menu in the upper left corner). 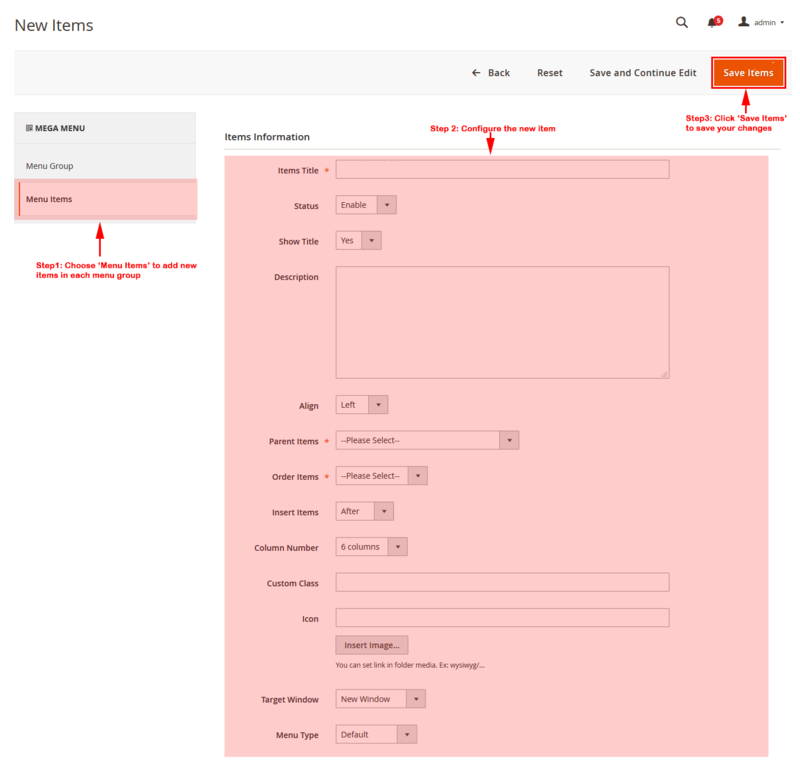 You will probably have to create a new CMS page if you want to have something different from your default home page. From the top menu, please select Content >> Elements >> Pages. 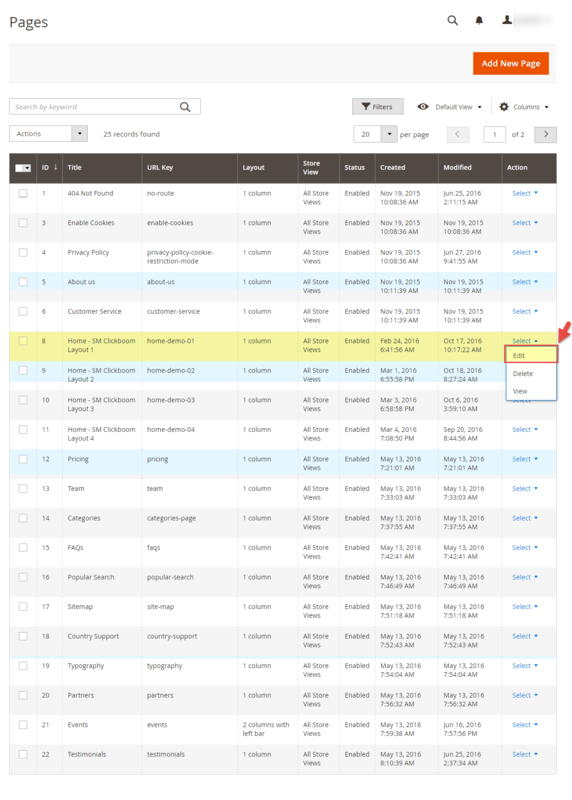 Here you can find all the store pages that you have imported, so you don’t need to add them. You only need to update the pages HTML and XML content as you wish. Step 1. Open any of them in order to get the access to the content. 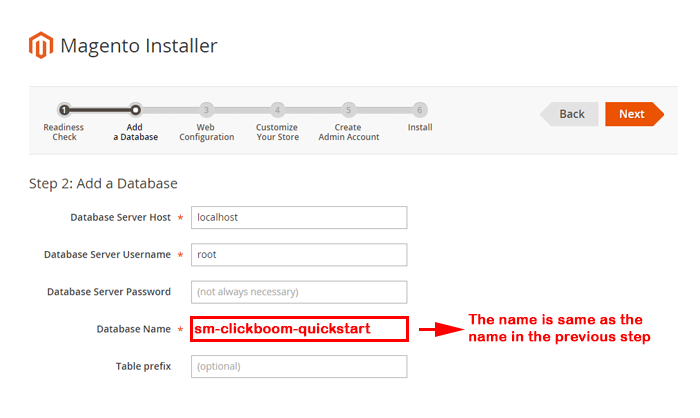 In SM Clickboom Administration Page, please navigate to Stores>> Settings>> Configuration >> MAGENTECH.COM to configure extensions as you want. 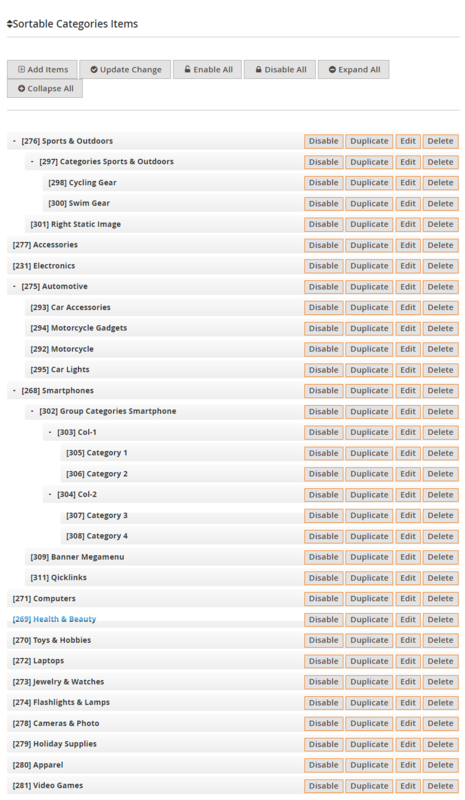 Here you can find all the extensions that you have imported successfully, so you don’t need to add them. You only need to look at our layout position, check the name of the extension you want to edit and update their settings as you wish. 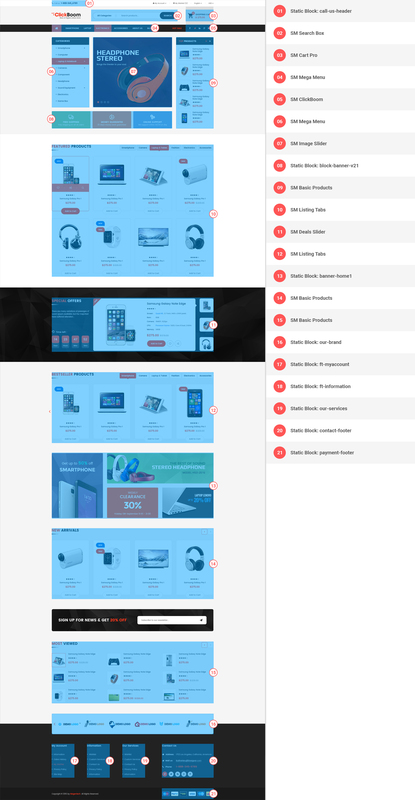 Moreover, to display the second mega menu in your store, you have an additional static block, for example: in this theme we have the Horizontal Megamenu being the second one. Therefore, please go to Content>> Elements>> Blocks and check if a static block with Identifier * : “megamenu-horizontal” had been imported or not. From the top menu, please select Content >> Elements >> Blocks. Here you can find all the static blocks that you have imported successfully, so you don’t need to add them. 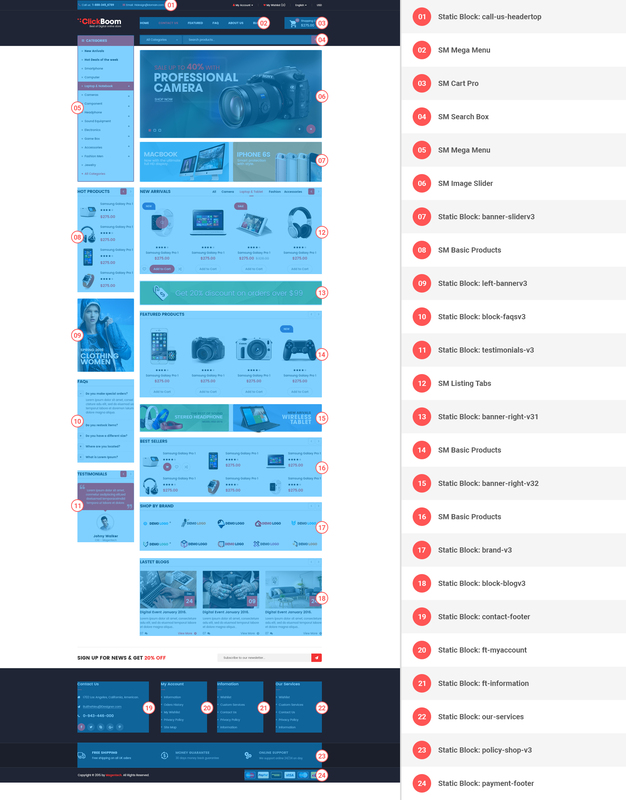 You only need to look at our layout position, check the identifier of the static blocks you want to edit and update their HTML content as you wish. In SM Clickboom Administration Page, please navigate to Stores>> Settings>> Configuration >> MAGENTECH.COM >> SM Clickboom >> Advanced to configure this theme’s copyright. Copyright © 2016 by <a href="magentech.com" title="Magentech">Magentech</a> . All Rights Reserved. In SM Clickboom Administration Page, please navigate to Stores>> Settings >> Configuration >> MAGENTECH.COM >> SM Clickboom >> Socials.